Can MTN Nigeria Survive Multiple Fines? The Central Bank of Nigeria (CBN) has told a Federal High Court in Lagos that contrary to the impression that it imposed a fine on MTN Nigeria, it merely directed the telecoms giant to refund the foreign exchange it improperly purchased in return for the naira equivalent. The bank disclosed this in its preliminary objection cited by THISDAY yesterday. It, therefore, asked the court to dismiss the suit filed against its decision by the telecoms firm because it lacks the jurisdiction to hear the case. The CBN recently directed MTN Nigeria to refund the sum of$8,134,312,397, over allegations that the telecoms company violated the extant laws and regulations of the Federal Republic of Nigeria, including the Foreign Exchange (Monitoring and Miscellaneous Provisions) Act, 1995, and the Foreign Exchange Manual, 2006. But the telecoms firm had denied the allegations. It consequently filed a suit in the court to challenge the decision. It said the apex bank did not give it the right of fair hearing and that the bank lacked the powers to determine its civil obligations and penal liabilities. However, when the suit came up yesterday, the presiding judge of the court, Justice Saliu Saidu, while adjourning the suit till December 4, 2018, for the hearing of all pending applications, directed that hearing notice be served on the Attorney General of the Federation (AGF), Mr. Abubakar Malami (SAN), who was joined as the 2nd defendant in the suit, but absent and not represented in court. While MTN Nigeria was represented by Chief Wole Olanipekun (SAN), who led 14 other lawyers, including Prof. Fabian Ajogwu (SAN), Mr. Damian Dodo (SAN), Mr. Adeniyi Adegbonmire (SAN), and Mr. Bode Olanipekun (SAN), to prosecute the matter, the CBN was represented by Messrs Seyi Sowemimo (SAN) and Ademola Akinrele (SAN). In the suit, marked FHC/L/CS/1475/2018, MTN is seeking a court declaration that it is "not liable to refund $8,134,312,397.63 to the coffers of the 1st defendant (CBN) premised on the decisions reached in the 1st defendant's letter of 28/8/2018." The telecommunications giant is urging the court to declare that "the 1st defendant's decision in its letter of August 28, 2018 with Ref No GBD/GOV/COM/DGF/118/121 addressed to the plaintiff and titled, 'Investigation into the remittance of foreign exchange on the basis of the illegal capital importation certificates issued to MTN Nigeria Communications Limited' were reached in breach of the plaintiff's right to fair hearing." The firm wants Justice Saidu to hold that the CBN "lacks the power to determine the civil obligations or penal liabilities of the plaintiff." It is urging the court to declare that the CBN acted ultra vires its statutory powers when it wrote the August 18 letter to it demanding a refund of $8.1billion. The firm asked the court to hold that the $8.1billion demand was "illegal, oppressive, abusive, unauthorised and unconstitutional." But in a preliminary objection filed by the CBN and cited by THISDAY yesterday, the apex bank said the lack of right of fair hearing by the telecoms firm was untenable in the face of the letter of Standard Chartered Bank admitting irregularities and violations of the extant foreign exchange regulations in the issuance of capital importation certificates. The CBN added that it merely directed the plaintiff to undo the transaction by making a refund of the foreign exchange improperly purchased in return for the naira equivalent and impose no fine or penalty whatsoever. 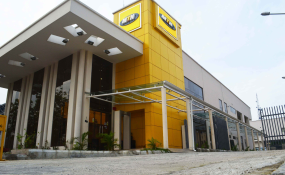 It also said MTN was given fair hearing because it admitted that its officials attended a meeting with the defendants where the issue was fully addressed in May 2018. It contended that declaration and injunction are equitable and discretionary remedies which are not available to a litigant who approaches the court with unclean hands.